“The tyranny of a prince in an oligarchy is not so dangerous to the public welfare as the apathy of a citizen in a democracy.” Montesquieu, Spirit of the laws, 1748. Montesquieu warned citizens not to become apathetic with how their Government is performing or loose site of Governments actions. Fables of Cicero tell us why. Unfortunately, after the Bill(s) of rights, American, British, French, and more, humanity lost touch with the roots of war, thousands of years of human history, the rise and fall of Kings, Monarchies, Dynasties, Feudal warlords, Religions. How and why these governments rose to power and what caused them to come hurtling down. Is it perhaps time to consider a very different kind of Government construct? How did Einstein define Apathy? Could we all step OutSide the Box, work together, use our minds, redefine Governing of humanity and the planet on truth, science, knowledge, and like nature focus on the pursuit of humanities perfection? Ask Giordano Bruno This time if we join together they want hang us ALL. Considered Father of Modern Science. Twenty five hundred years ago Confucius had done just that. Imagine 2,500 years ago just trying to survive in the world without electricity, running water, cars, bicycles. Think about it all, it’s a pretty extensive list yet, Confucius is known to have spent time studying chinese history when developing his philosophy, in fact, it was his quest to find those things in Chinese history that made a dynasty great and what made them fall. He sought the best ways to Govern and to rule a society. Can you imagine how hard it was in that time period to actually keep history available for consumption? Or just to share your thoughts OutSide the Box. Is it time to consider flipping Confucius quest? Can we think OutSide the Box? Rather than being imprisoned by government or religion how might humanity imprison them? Confucius died believing his philosophies a failure, but his seeds grew roots and his philosophical teachings became among the world’s most prolific. The rise and fall of the Roman empire would follow, great philosophers Socrates, Plato, Aristotle, Epicurious, came and went contemplating, debating, teaching, refining the arts of reason, exploring the depths of their ability to understand the nature of the world around them. What was their purpose? What was the best way to live, where do ethics and morality originate, what is this place I call reality? A thousand years, no tv, no motorized transportation, no phone, no internet, just philosophical ideas shared on handwritten documents often duplicated with room for error. More than a thousand years of philosophical effort, thought, contemplation by the greatest of thinkers. Today’s humanity is mostly ignorant of their work, too lazy to exercise their minds with such hefty thought.To lazy even to learn what they thought or what the importance or validity of their thought. I’m still will likly spend the rest of my life trying to catch up with them. For anyone reading this. I tell my own daughter Philosophize This with I;am Stephen West is an extraordinary free learning opportunity. “Those who cannot remember the past are condemned to repeat it.” Unless nature decides humanity’s to stupid to keep. Is there a glitch in humanities program code causing it to dump critical data? Is Humanity like AI taught to think and reason and yet with the input of garbage is garbage? For thousands of years governments rise and fall each demanding its citizens follow their doctrines of faith. Greek Gods, roman rule and the streets of Athens would give rise to sophist men who taught various artful forms of winning ones case without any moral ethic resolve but purely to win. Socrates himself gave his own life by presenting what’s considered the worst legal defense in history. He basically refused to abandoned his principal belief in living a virtuous life. He refused lying to the court to avoid punishment for an offense he’d not committed. Forced to drink poison for being accused a sophist, liar, lawyer after the Oligarchs of death lost power over Rome in the age of Thirty Tyrants of Athens.The people had not stood for the despotism of oligarchs must we? After the tyrants the people had little trust. Why would they? Hundreds, thousands of Gods who never seemed to answer the people’s prayers came and went regardless of the sacrifices. From the ashes of Europe, China, Asia, India, and the Middle East rose Buddhism, Taoism, Catholicism, Hebraism, Islam, Christianity. A diversity of faiths. For hundreds of years to follow religious wars raged as the dark ages ensued. In Europe the reformation led to war after war between Protestants and Catholics. From these beginnings came the ages of enlightenment and the Philosopher, antarchist, John Locke, and Montesquieu, philosopher, lawyer, politician, author of the most authoritative contemplated treatise on the operation of Government known to America’s founding fathers. John Locke English philosopher and physician, widely regarded as one of the most influential of Enlightenment thinkers and commonly known as the “Father of Liberalism“. These men lived times when the only form of education was the passing of history through the written word and the modes of transportation were challenging to say the least. Protestants and Catholics warred in France and a relative calm settled over France despite the strife between the Catholics and the Huguenots (French Protestants), the court of Henry III was then dominated by a tolerant faction of the Politiques (moderate Catholics, sympathizers of the Protestant King of Navarre, Henry of Bourbon, who became heir apparent to the throne of France in 1584. Here in Paris France lived Giordano Bruno an Italian Dominican friar, philosopher, mathematician, poet, and cosmological theorist who proposed theories of an infinite universe with a multiplicity of worlds. The Roman Catholic and Reformed Churches of the time were struggling for the evangelization of Europe. Giordano believed Lucretius the universe was infinite, his god was infinite, and creation could be nothing less. He was excommunicated by the Roman Catholic Church for his beliefs. Bruno abandoned the Dominican order, and, after wandering in northern Italy, he went in 1578 to Geneva, where he earned his living by proofreading. He formally embraced Calvinism. After publishing a broadsheet against a Calvinist professor, however, he discovered that the Reformed church was no less intolerant than the Catholic. He was arrested, excommunicated, rehabilitated after retraction, and finally allowed to leave the city. He moved to France, first to Toulouse—where he unsuccessfully sought to be absolved by the Catholic church but was nevertheless appointed to a lectureship in philosophy—and then in 1581 to Paris. In Paris Bruno at last found a congenial place to work and teach. Despite the strife between the Catholics and the Huguenots (French Protestants), the court of Henry III was then dominated by the tolerant faction of the Politiques. Bruno’s religious attitude was compatible with this group, and he received the protection of the French king, who appointed him one of his temporary lecteursroyaux. In 1582 Bruno published three mnemotechnical works, in which he explored new means to attain an intimate knowledge of reality. He also published a vernacular comedy, Il candelaio (1582; “The Candlemaker”), which, through a vivid representation of contemporary Neapolitan society, constituted a protest against the moral and social corruption of the time The Spaccio de la bestia trionfante (1584; The Expulsion of the Triumphant Beast), the first dialogue of his moral trilogy, is a satire on contemporary superstitions and vices, embodying a strong criticism of Christian ethics—particularly the Calvinistic principle of salvation by faith alone, to which Bruno opposes an exalted view of the dignity of all human activities. The Cabala del cavallo Pegaseo (1585; “Cabal of the Horse Pegasus”), similar to but more pessimistic than the previous work, includes a discussion of the relationship between the human soul and the universal soul, concluding with the negation of the absolute individuality of the former. In the De gli eroici furori (1585; The Heroic Frenzies), Bruno, making use of Neoplatonic imagery, treats the attainment of union with the infinite One by the human soul and exhorts man to the conquest of virtue and truth. Can we think OutSide the Box to redefine the constructs of humanity for the conquest of virtue and truth? January 27, 1593, Bruno entered the jail of the Roman palace of the Sant’Uffizio (Holy Office). “Perhaps your fear in passing judgment on me is greater than mine in receiving it. Bruno was hung naked upside down and burned at the stake by the Church’s of the Day. For Thinking OutSide the Box. In 1609 Considered beginning of the age of enlightenment Galileo invented the telescope and proposed a Heliocentric universe causing a conflict with the Catholic Church and he was put under house arrest by the inquisition for spreading ideas in contrast with religious doctrine. Galileo’s ideas were a key role in the scientific revolution inspired through Enlightenment, where people were turning to rationalization through science and questioning the great authority the Church had in the time period. The Thirty Years’ War ended in 1648. It led to the division of Western Christianity into different confessions (Catholic, Lutheran, Reformed, Anglican, Anabaptist, Unitarian, etc.). By the time of its arrival, Western Christianity was only compromised in the Lands of the Bohemian Crown, where Utraquist Hussitism was officially acknowledged by both the Pope and the Holy Roman Emperor; in addition, various movements (includingLollards in England and Waldensians In Italy and France) were still being actively suppressed. As William the Silent wrote in his marriage proposal to the uncle of his second wife, the Elector August of Saxony, he held Orange as “my own free property”, not as a fief of any suzerain; neither the Pope, nor the Kings of Spain or France. That historical position of honor and reputation would later drive William the Silent forward, as much as it also fueled the opposition of his great grandson William III to Louis XIV, when that king invaded and occupied Orange. Louis XIV of France began his personal rule of France in 1661, after the death of his chief minister, the Italian Cardinal Mazarin.An adherent of the concept of the divine right of kings, which advocates the divine origin of monarchical rule, Louis continued his predecessors’ work of creating a centralised state governed from the capital. He sought to eliminate the remnants of feudalism persisting in parts of France and, by compelling many members of the nobility to inhabit his lavish Palace of Versailles, succeeded in pacifying the aristocracy, many members of which had participated in the Fronde rebellion during Louis’ minority. By these means he became one of the most powerful French monarchs and consolidated a system of absolute monarchical rule in France that endured until the French Revolution. History never repeats but always rhymes. Louis encouraged and benefited from the work of prominent political, military, and cultural figures such as Mazarin, Colbert, Louvois, the Grand Condé, Turenne, Sébastien Le Prestre de Vauban, André Charles Boulle, Molière, Racine, Boileau, La Fontaine, Lully, Marais, Le Brun, Rigaud, Bossuet, Le Vau, Mansart, Charles, Claude Perrault, and Le Nôtre. During Louis’ reign, France was the leading European power, and it fought three major wars: the Franco-Dutch War, the War of the League of Augsburg, and the War of the Spanish Succession. There were also two lesser conflicts: the War of Devolution and the War of the Reunions. Warfare defined the foreign policy of Louis XIV, and his personality shaped his approach. Impelled “by a mix of commerce, revenge, and pique”, Louis sensed that warfare was the ideal way to enhance his glory. In peacetime he concentrated on preparing for the next war. He taught his diplomats that their job was to create tactical and strategic advantages for the French military. Were the views of the Catholic Church of France the same? In 1673, Louis XIV of France annexed all territory of the principality to France and to the royal domain, as part of the war actions against the stadtholder William III of Orange — who later became King William III of Great Britain. Orange ceased to exist as a sovereign realm, de facto. And my ancestors were banished from the land they’d held for over a thousand years on the Rhone the AOC of St Julien. The loss of these lands by Pérrié De St Julien I De Malacare is documented in parliamentary records of England in his petitions for funds for protestant french Huguenots to travel to America. See St Julien De Malacare in the History of Huguenot Pedigree. This is the history in which my ancestral roots run deep David DeCros St Julian was born 1605 in Béziers, Herault, Languedoc-Roussillon, France. David had a son Pierre de St Julien De Malacare I formerly St Julian aka Julien born 1641 in Vitré, Ille-et-Vilaine, Bretagne, France Pierre’s wife Jeanne (LeFebre) de St. Julien gave birth to twin sons in 1669. Pierre living in fear under the rule of Louis the XIV for his progeny named his sons Pierre Renee De St. Julien I 1 & 2 The birth record reflecting a single son But twins who would carry the same name, known only to close friends and family they were René and Piérré. Rene and Pierre had an older sister Aimee de St. Julian; born 3, 7, 1667 Charlotte Ravenel; born 5,15,1668 a younger brother Louis de St. Julian; Born 08,5,1670 sister Marguerite de St. Julian; Born 12,19,1671 younger brother Paul de St. Julian; Born 10,14.1673 and sisters Emilie de St. Julian; Born 1, 10,1675 Jeanne Renee de St. Julian Born 5,6, 1678 and Marie Ester de St. Julien Born 12,14,1679. Piérré De St Julien De Malacare I. Did not travel on the Richmond, today’s historical records show unequivocally he traveled to the UK with William of Orange, his wife, and several children to live in Ireland. Piérre [Rene] actually Piérre De St Julien De Malacare II was on the Richmond with his wife, is brother Louis and Sister Marguerite, Four St Juliens. Piérré’s buried and his will recorded in Charleston SC in French. Rene De St Julien De Malacare Piérré’s twin brother René Petit was also not on the Richmond and traveled to the UK with William II to lead dragoons in the Glorious revolution and the Battle of Boyne. Fore centuries now people have wondered what happened to Rene Petit and Piérré Fore and have never concluded who they really were. On the Ships Manifest, In the Petitions to England’s Parliament, see Royale Gem Of Malacare. The identities of these Individuals was obscured. See the Manifest. Piérré, His Wife, and a Friend are listed as his friend, his friend, and alsoe his friend. Their names not listed. More research is needed but I believe Piérré’s twin brother Réné filed the petitions with parliament, booked himself on the Richmond, his Brother Piérré and his wife. But, that he did not make the voyage which is verifiable in the annals of history. This was all done to keep there wearabouts from being known by Louis XIV, Catholic Churches, and the Reformed Churches of the time.Piérré De St Julien was a descendant of Piérré De St Julien friend of the apostle Peter where together they been fisherman in youth on the Rhone. In 1685 under the rule of Louis XIV of France the Edict of Nantes, which granted rights to Huguenots, was abolished. The revocation effectively forced Huguenots to emigrate or convert in a wave of dragonnades, which managed to virtually destroy the French Protestant minority divesting French Protestants of all religious and political prerogatives. The English were happy to encourage these refugees to settle in the colonies, most of whom were representative of France’s prosperous merchant and professional classes. More refugees followed, and in 1687, a church was built on what is now the corner of Church St. and Queen St. in downtown Charleston. About four hundred and fifty Huguenots had settled in the Low Country of South Carolina by 1700. In 1679 Pierre a presbyterian minister and wife Jeanne and children all fled France through the Netherlands. From France Charlotte, Pierre II, Louis, and Marguerite set sail for America landing in Charleston South Carolina, Pierre de St Julien De Malacare I and siblings are contained in the list known as the “St:Julien” or “Ravenel” list. 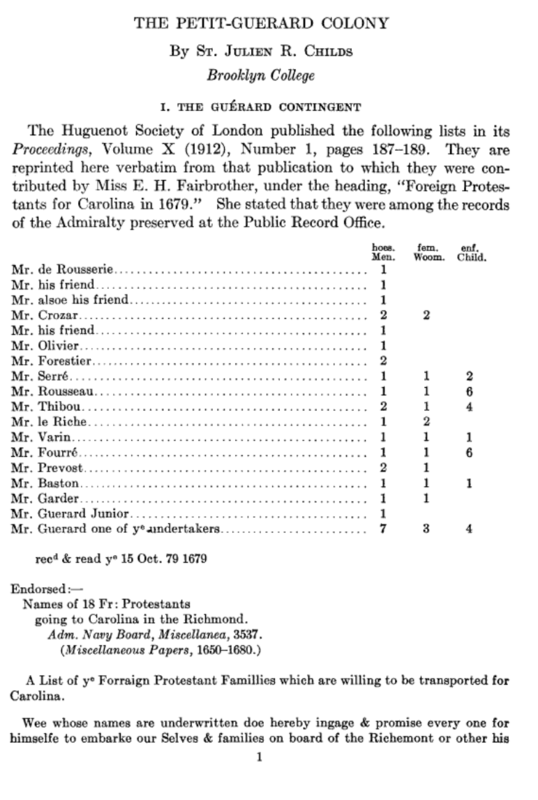 This is a list of French and Swiss refugees in Carolina who desired to be naturalized. Its date by comparison of names with births has been fixed at about 1696. It was found among the papers of Henry de St: Julien of St Johns Berkley who died in 1768 or 1769 and was the youngest son of Pierre de St: Julien mentioned in the list. His papers came into the possession of M’. Daniel Ravenel of Wantoot and the list was first published in 1822 in the Southern Intelligencer a paper published in Charleston. It was re-published in 1867 and again in pamphlet form by T. Gaillard Thomas M. D. in 1888; and in 1897 in the Transactions of the Huguenot Society of S. C. These same documents list Marie, Charles Fromagett as Pierre’s wife at the time he purchased transportation for what is believed to be 27 individuals aboard the Richmond which arrived in Charleston SC in the fall of 1680.These documents have inconsistencies which are explainable with truth. I have discovered the Analysis of the names of these individuals is inaccurate and has been misunderstood by historians all these years. While others may have figured this out I’ve found no indication that’s the case. So for posterity I wish to explain why I believe their analysis was seriously flawed. I don’t have time now to work on analyzing the correct numbers .But I will explain for those who might pursue it why I claim the current analysis is flawed. First historians have not accepted that individuals on the Richmond were French it is stated in the record that while they believed that to be true they did not have solid information on which to establish that fact. The internet and ancestral records verify that in fact my ancestor Piérré and his family were all in fact French Huguenots fleeing the persecution of Louis XIV of France. So while there are many mistakes in the analysis. This the first and perhaps largest. Guérard and Petit are not family names they’re French words. Guérard is actually spelled Guérard and is a French commune in North central France. The word means “not in accordance with philosophic knowledge or methods an unphilosophic judgment” Parliamentary England details confirm the funds for the Richmond and the land grants were secured by William II . Petit actually Pétit is actually French for Small and I believe was reference for the petitioners of land grants. I also believe for various reasons that 17 Deer is not a date at all but a reference to 17 individuals from the Comtat Venaissin an enclave in the Kingdom of France which included the town of Orange and Avignon and was known as the Principality of Orange. The Enclave had been bequeathed to the Holy See in 1271. The enclaves inhabitants did not pay taxes and were not subject to military service, making life in the Comtat considerably more attractive than under the French Crown.1. When Louis XIV, invaded and occupied the Principality of Orange. Perrie, Renee St Julien a Protestant minister in the province of Orange and owner of St Juliens in the province of Orange between Orange and Avignon on the Rhone river at a junction known as Guérard. Protestants including William of Orange fleed the rule of Louis XIV and sought refuge in Guérard commune of north east of France just outside paris.They fought their last battle in August 1678 at the battle of St Denis. The Richmond set sail from ? England or Netherlands October 29, 1679. Arrived in South Carolina and the First of Issue of land as instructed by William II were made in South Carolina on August 5, 1680. The Plantation adjoins the land on which the Episcopal Chapel “St. Thomas’ parish now stands known as the “Ponkinhill “Chapel. Pierre de St Julien I and his wife Jeanne (LeFebre) de St. Julien along with Aimee and the younger children Paul, Emilie, Jeanne, and Marie. René De St Julien sailed with William III of Orange to the United Kingdom where there William took the English Crown in the Bloodless War.